With the 2019 color of the year being named as Living Coral, it’s no wonder that fun pops of the hue are turning up everywhere. A classic color in its own right, a peach wedding may be on the horizon for you. And to top this lovely event off, it is styled at the US National Arboretum, which recently opened its doors for weddings. 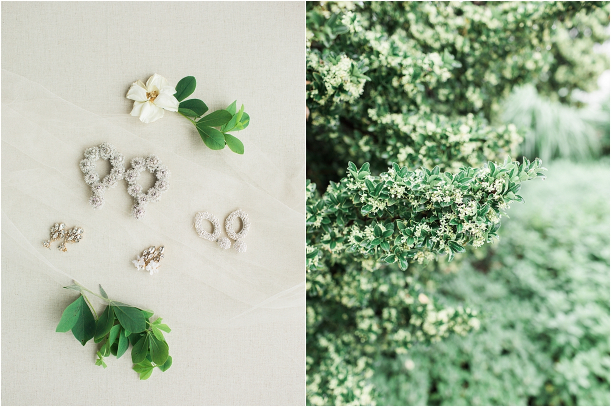 It’s stunning as you will see in this beautifully styled Virginia wedding. I adore Virginia weddings! There is just something about being in the south while still being close to the north that makes weddings so gorgeous. And this styled shoot actually took place as an anniversary session for a couple that is married. How fun for them to partially relive their wedding day! They also offered a few sage words of advice about marriage. What is your favorite thing about marriage? I get to change the world by choosing to unconditionally love someone. I have an extremely delicate power to either build someone up or tear them down like no one else can. Although we don’t do this perfectly, we are each other’s safe place. That’s like the coolest honor I could ever have in life. What is one piece of marriage advice? Be intentional. Good, healthy and thriving marriages do not just happen. Remaining engaged and attune to what the other is feeling does not come natural, especially as the relationship goes on. You can never take your foot off the gas and just cruise. Complacency kills. Covenant keeps. Of course, the peach wedding invitations set the tone right away. The fruits are so cheery, round and full! Plus, I am completely loving the trend of vintage stamps. Beautiful! Bling is incorporated in several ways, yet it is not overdone. The bride’s separates are fairly simple, so adding statement shoes along with jewelry and a stunning hairpiece add interest. That bouquet!! I am always a huge fan of florals, and the stunning texture of the flowers, berries, and leaves create a lovely piece for the bride to carry. 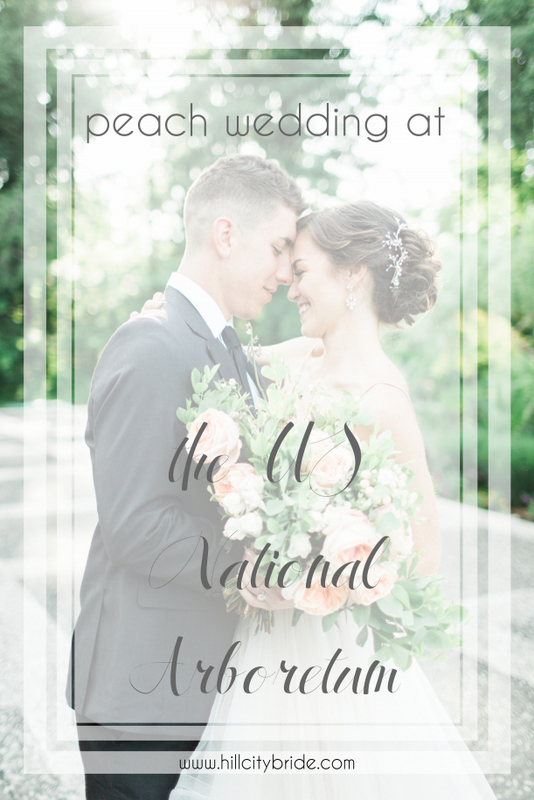 The National Arboretum is so gorgeous as the backdrop for this styled peach wedding. Everything is so lush, green, and beautifully lit. Ah! The catering and cocktails are amazing. Often in styled events, the food is omitted, but it adds so much. And it gives brides and grooms ideas for their own reception edibles. Kudos! 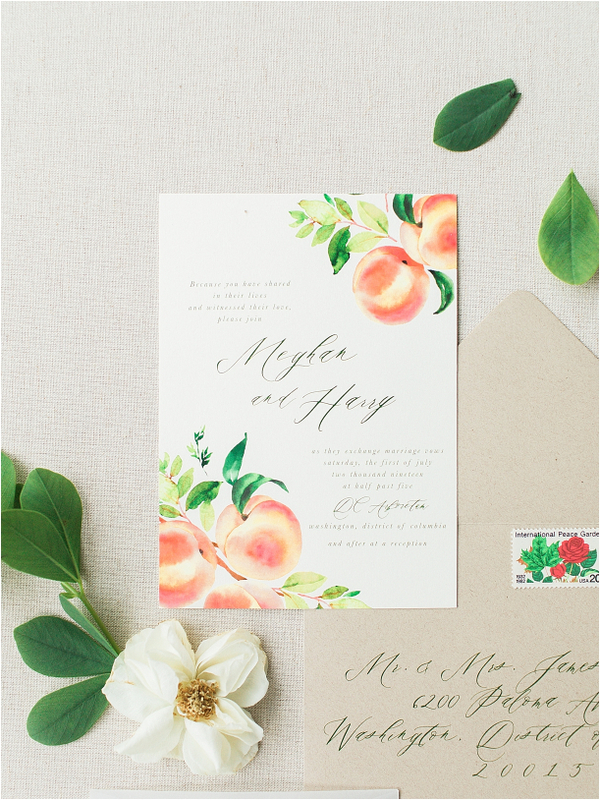 Enjoy this peach wedding in Virginia today! Craving more inspiration in this hue? Take a peek here! Marcie - I’m loving the peach vibe! So classic, yet fun and playful. So excited about the coral colors this year, too! Amber - Gorgeous!! I love the inspiration of peaches and the little touches everywhere. Really beautiful. Aditi Wardhan Singh - This is so beautiful. Those shoes are just my style. The pictures make the day seem just magical!! Rachel - This entire wedding is ADORABLE! I love the peach incorporated into everything. THE FOOD OMG THE FOOD!! YUM!